World Record - 17 lbs. 2 oz. These fighting saltwater game fish are long and eel-like in appearance. The body is mostly a silvery color with darker fins. The pectoral fins (behind the gills) have a hint of yellow at the base, and the tail is deeply cut like a "V". They will grow to about 20 pounds and about 41" long. The world record is currently 17 pounds, 2 ounces, and was caught in May 2007 near Islamadora in the Florida Keys. SPECIAL NOTE: Ten current world records have been caught near Islamadora. It apparently is THE place to fish for them! 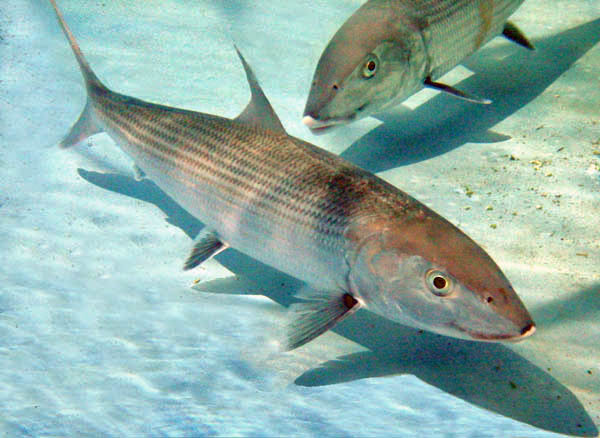 Bonefish are native to warm salt water everywhere. They tend to stay around relatively shallow waters from 8 inches to 15 feet deep. You can find them near sandy bottoms or near submerged grassy areas. 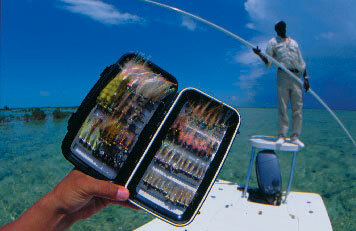 These areas are lovingly called bonefish flats by guides and anglers the world over. Spawning takes place from November thru June, with the female laying as many as 1,700,000 eggs! Where exactly they go to spawn is a complete mystery. Nobody knows where they go to make babies. Perhaps they, like us, prefer to be private in those, um, "personal" moments. Once hatched, the larval stage runs for around 45 to 75 days, after which the growth period begins. These fish will grow rapidly for 5 or 6 years, and then this slows down dramatically. Males mature at 3 ½ years (17 inches) ,while the females mature at 4 1/3 years (19 inches). This is a schooling fish, and will run in groups of as few as 5 to as many as 100. Larger fish will go play "James Dean" and travel alone. These fish, like a few others, have an "air bladder" that can be filled to help compensate for water that is oxygen deficient. Not quite an amphibian, but they do take breaths here and there in this way. 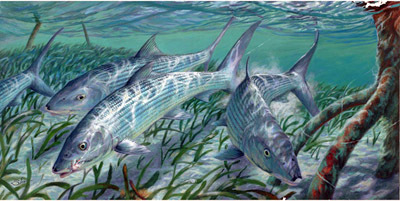 Bonefish are carnivores and are known to eat benthic marine life (things that live on the ocean floor), different types of worms, immature young fish (fry), shrimp, small crabs, squids, and small octopi. 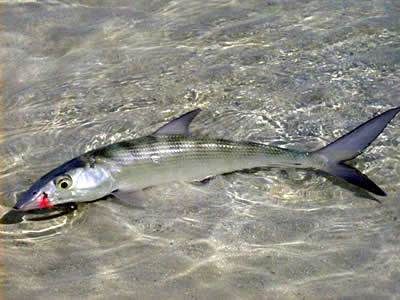 Normally, bonefish are not an eating fish and are mainly sought for sport. So much so that recipes for the fish are non-existent. So don't eat 'em, folks. Just let 'em go and try to catch 'em again! Send 'em back to the sea for someone else to hook. The fish you catch today may be tomorrow's world record.